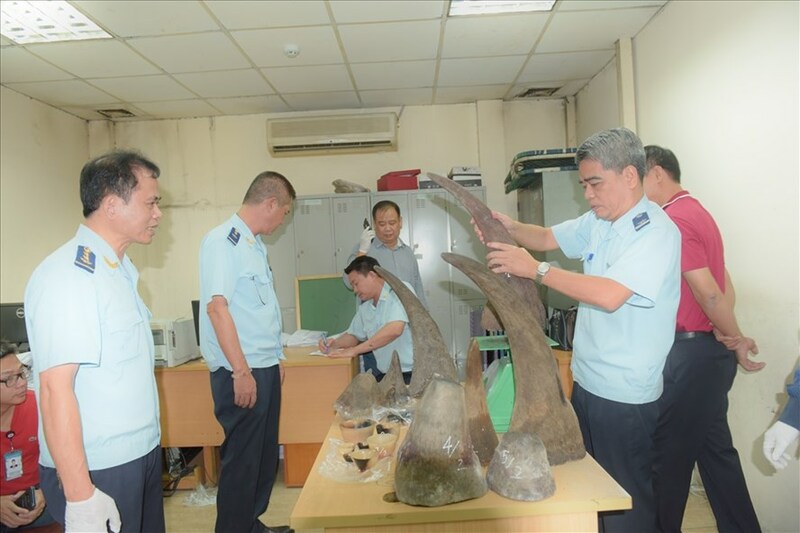 Customs officers at the Noi Bai International Airport in Hanoi have seized nearly 34 kilos of rhino horn from South Africa. The batch was found on October 12 when authorities checked a 53-kilo package which was transported on the QR 8954 flight operated by Qatar Airways, departing from South Africa, transiting in Doha and landing in Vietnam on October 4. According to the airport customs department, the sender was a company in South Africa and the receiver was named Truong Van Nam in Soc Son District in Hanoi, who claimed it was not for him and had refused to accept the delivery. There were 13 rhino horns and some products made from the horns found in the package, the department said. This is the second seize of wild animal products at Noi Bai Airport in two months of September and October. On September 29, nearly one tonne of ivory, pangolin scales and other parts of wild animals were seized here after being illegally brought in from Nigeria.